Frost wall insulation - Check! These photos pretty much speak for themselves. It took us all day on Sunday to get the insulation on. We used 36 sheets of R10 insulation, and 14 large cans of PL 300 foam adhesive. And it took us each about 3 days to fully recover. Yay! Insulation all on! About 7:30 pm on Sunday. Done! And what a coincidence that it was beer o'clock! Grinding off the rebar. We left a lot of them though to help hold the insulation in place. Here is a picture of our lot, as of last night. This pretty much shows everything that's going on. This is another photo from our trip around the loop road over the easter weekend. I have plans to paint this one sometime soon. Aren't my doggies cute? :) These are some shots from last Sunday at my parent's beach. Emma was being dainty and didn't want to go for a swim, but Kirby was all over it, and a chunk of driftwood. I took these photos at my parent's house over Christmas this year. I spent about a half hour standing as still as I could to get these shots! Today I am posting a photo that I took in December of last year. We cleared this area on our lot last summer, thinking it may be a good spot for a house. Since deciding to put the house elsewhere, this spot may be used for a garden in the future. Also, I will probably be posting photos more frequently in the future. I have limited time to paint, and I take lots of photos to serve as references for paintings, but some of them are nice in their own right. So stay tuned! Here's another one I did for the Ultimate Dressage Challenge. This time I stuck to the three colour rule, and used dark purple, lavender, and bright orange (and white). I'm quite pleased with the results! 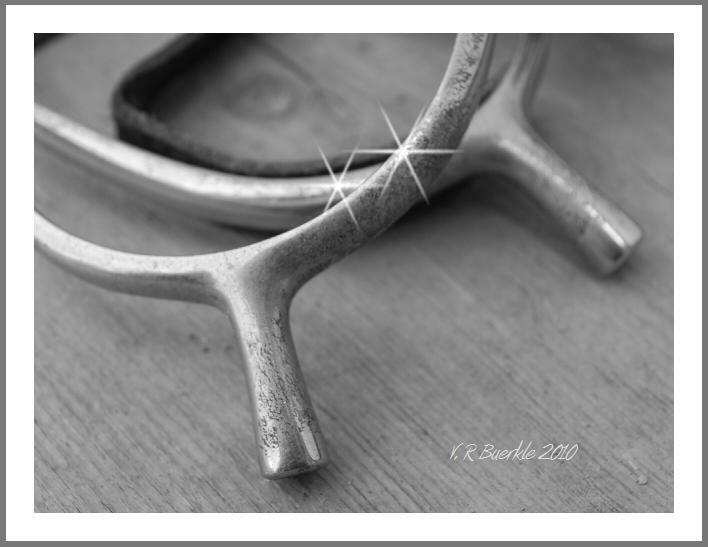 These images were done for a challenge on Ultimate Dressage - to take a common barn object and render it in black and white. The challenge was open to all mediums, so there were some interesting things posted, including a bejewelled hoofpick done with black beads and pearls. 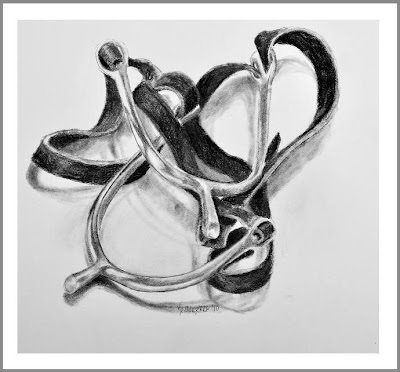 Anyway, above is a photo I took for the challenge, and here is a sketch, from life, of my spurs.